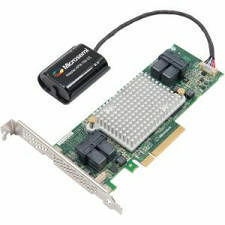 The Adaptec Series 8 RAID adapter family features PMC's 12Gb/s RAID-on-Chip (ROC), which combines a x8 PCIe Gen3 interface with 12Gb/s SAS ports to enable a new generation of high- performance RAID adapters for the 12Gb/s storage ecosystem. Adaptec Series 8 RAID adapters are available with 4, 8, or 16 native SAS/SATA ports in an LP/MD2 form factor. The mini SAS HD connectors combined with SAS HD cables allow for greater flexibility in configuration options by supporting up to 16 native SAS/SATA ports in a Low-Profile MD2 form factor. Series 8 adapters perform at up to 6.6 GB/s on sequential reads and up to 6.2 GB/s on sequential writes. With 16 direct-connected solid-state drives (SSDs), Series 8 adapters deliver more than 700K IOPS. Adaptec RAID Code (ARC) delivers maximum reliability with RAID levels 0, 1, 1E, 5, 6, 10, 50 and 60. ARC also offers RAID Level Migration (the ability to easily migrate RAID levels), Online Capacity Expansion (expand capacity without powering down the server), and Copyback Hot Spare (when a failed drive has been replaced, data is automatically copied from the hot spare back to the restored drive). Additionally, the auto configuration capability allows users to operate in HBA mode (expose drives to the host directly) or Simple Volume mode (use fast DRAM cache to reduce latency and improve performance), without the need to use setup tools. In RAID mode, they can mix and match all devices and handle them at the same time. Zero-Maintenance Cache Protection (ZMCP), is a revolutionary advancement that solves BBU deficiencies by providing full protection to cached data with no monitoring, maintenance, disposal, or replacement costs. ZMCP features SLC based NAND flash memory with super capacitor technology. During a system power loss, the flash memory-based cache protection can preserve data for years. Zero-Maintenance Cache Protection (ZMCP) is included with the 81605Z and sold separately for the 8885, 8805, and 8405.